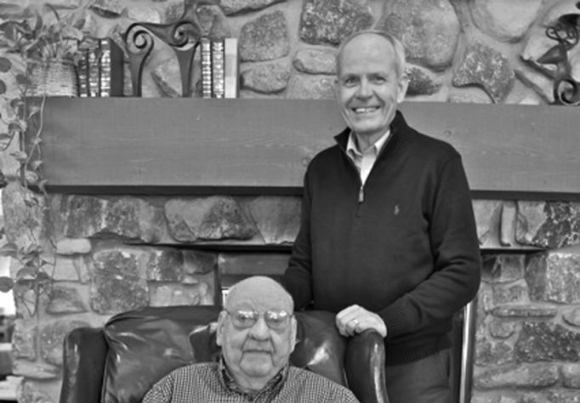 Greg Casperson (standing) with his late father Clyde. Photo by Paula Hedeen taken in 2011. The moment happened 47 years ago, but the memory is clear to Chris Forbes. A day earlier she had taken her young daughter Stephanie to the hospital wrapped in blankets and struggling to breathe. Hours later she went home with only the blankets, lost in the disbelief, experiencing the numb fog that arrives when a parent must bury a child. “It’s like somebody gave you a drug where you know where you are, but you can’t do anything,” she remembered. Days later she walked up to the Casperson Funeral Home, still feeling her way through the fog, looking for Clyde Casperson or his son, Greg. For 98 years, the Casperson family has been helping people feel less alone in their darkest hours: a grandmother’s slow fade, a brother’s sudden death in a car crash. In those times and all others, first Edwin, then Clyde, and for nearly five decades, Greg Casperson have been there in the heart of Sister Bay, reaching out a hand. Casperson Funeral Home has been a fixture on Bay Shore Drive in Sister Bay for generations. Photo by Myles Dannhausen Jr. But how? How does a man do it every day? How does a person in a tiny, isolated town of fewer than 900 people, do a job that requires that he be there for people on one of the hardest days of their life? Or worse, how does one do the heavy lifting of burying a friend’s parent or child? Or a childhood friend you’ve known your entire life? Even Greg isn’t entirely sure. 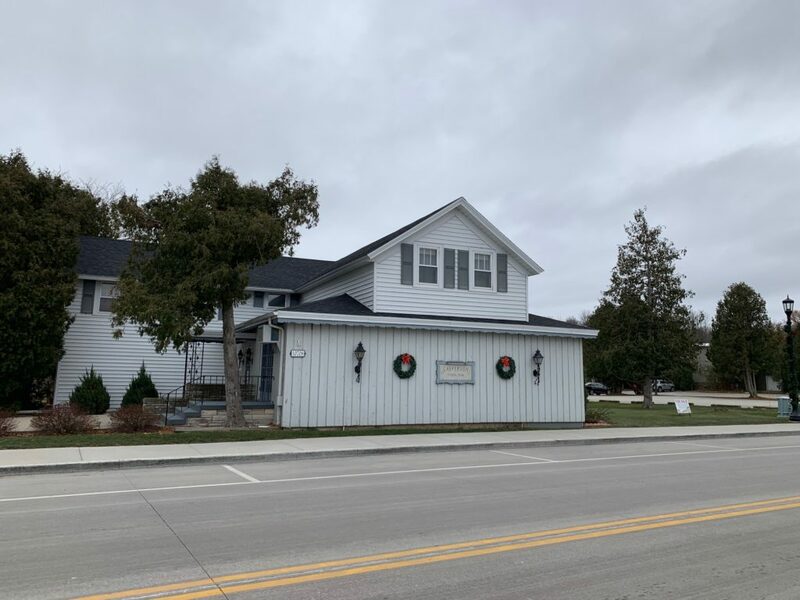 In October, Greg and his wife, Debbie, sold the funeral-home business to Huehns Funeral Home in Sturgeon Bay. Greg continues to work for Huehns, but friends will gather Feb. 10 at Shepherd of the Bay Lutheran Church in Ellison Bay to thank the family for a century of being on call to the community 24 hours a day, 365 days a year. Clyde was a fire chief who ran the ambulance service when Greg was growing up, so the phone in the Casperson home was always ringing with bad news. Sometimes young Greg answered the phone, and, if it was a fire, he ran over to ring the fire siren at the station, then wrote in chalk where the fire was. By the time he was eight, he was joining Clyde on calls, helping pull out the hoses. “You’d see families in grief, and it was usually people that we knew,” Greg said. To the outsider, it seems that absorbing that grief every day would become too much to bear, but Greg said it was as much an opportunity as a burden. Greg and Debbie have one daughter, Sarah, who, like her father, didn’t think too much about growing up in a funeral home. When we think of the funeral business, we think of bodies, and we think of death. But the Caspersons think of something else. The funeral, Greg said, is about taking care of a person who has lost someone. Forbes later worked with Greg as a paramedic. She witnessed the effect he had on the scene of tragedies, on the hearts of people in shock and grief. He always arrived in a suit, a sign that a professional was there – permission to exhale. She said that sometimes she could see the pain on his face, especially when it was a young person or someone they knew. Greg would take a minute to collect himself, then morph back into the rock for the family at hand. People who know that sometimes solace comes in words, sometimes through a hug, and sometimes as an outstretched hand holding a little pink brush. Friends will gather after the 9:30 am worship service for refreshments and to thank Greg and Debbie Casperson for their years of service to the community.